The Red Cross is making a public appeal in Nepal for information on more than 800 people missing during the decade-long insurgency in the country. On Thursday it published the names of the missing on its website and in the local media. They have requested people to come forward with any information. About 50 are believed killed, but the rest who went missing were either arrested by the security forces or captured by the Maoists rebels. "The families of these missing persons suffer intolerably from not knowing what has happened to their loved ones and they have the right to know," Mary Werntz, a representative of the International Committee of the Red Cross (ICRC) in Nepal, told reporters. "We do not claim this list is necessarily comprehensive. We know from other conflict situations that once there is peace, normally the numbers [of missing people] increases slightly." The BBC's Nepal correspondent, Charles Haviland, says that it is extremely rare for the ICRC to give press conferences. 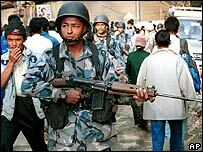 Our correspondent says that during the Maoist insurgency, Nepal became one of the world's most notorious countries for political disappearances. 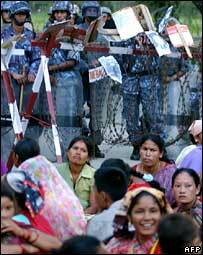 The majority were people taken by the security forces on suspicion of being involved with the Maoists or helping them. Others were abducted by the Maoists - some were children. The ICRC hopes that the list of 812 disappeared people published on its website and in the Nepalese press may lead people to come forward with information on them. The ICRC and the National Red Cross Society are in regular contact with all the concerned families. An ICRC official told the BBC there could be more missing people and that families should contact them it if their missing members were not listed. Last year the government of Nepal gave details of over 170 people who went missing during the decade-long armed conflict in Nepal. Fifty-two were killed it says, allegedly after being taken into custody by security forces, one had absconded and the rest have already been released, the government said. The government said it was unable to confirm the status of 602 others. King Gyanendra seized absolute power in February 2005. But he was forced to restore parliamentary democracy last April following sustained street protests. He has since been stripped of nearly all his powers. Thirteen thousand people died in a decade-long insurgency before the Maoists agreed to stop fighting and join the government.